Muriel and her team welcome you every day. Restaurant, bar, ice cream saloon, Le Grillou offers from the morning on breakfast formulas. Nonstop open, you can enjoy a drink on the sunny terrace or enjoy a meal. Come and try our menu and our specialties such as wood oven pizzas. Discover our local dishes like muchroom cassolette, or our chestnut flan. All this in harmony with a good selection of the finest wines. Situated in the village Grospierre, the Garden of Secrets invites you to dicover their bar, restaurant and splendid terrace. A place where you can enjoy a beer between friends and savor their specialties. Ideally situated in close proximity to Vallon Pont d’Arc, this property hides its treasures in the heart of an inner courtyard overlooking the vineyards. This restaurant welcomes you in its big vaulted room or on its shady terrace, in calm, genuine and timeless surroundings. You will discover all the delicacies of the Ardèche cuisine and from other places too. Le Restaurant « La Bergerie » est ouvert toute l’année. Notre capacité d’accueil nous permet de recevoir des groupes (des menus sont proposés aux caristes). Nos aménagements nous permettent de recevoir les personnes handicapées. Nos menus allient tradition et modernité. En saison un grill est à votre disposition. Des soirées à thèmes viennent porter une touche folklorique au moment que vous pouvez passer chez nous. Join us for a culinary trip by the atmosphere, the tastes, the flavors, the unique textures of Ardèche and the Camargue. Likoké welcomes you in Les Vans, where you can find the sun on your skin as well as on your plate. Restaurant, fresh local products, bistrot menu, selected wines by our independent winemakers. The terrace offers you an amazing view over our private beach next to the river Ardeche. Come and dicover our different salads, our homemade hamburgers, our kebab or other high quality snacks. Nonstop open from 12-6pm. Free entry for Double L customers. 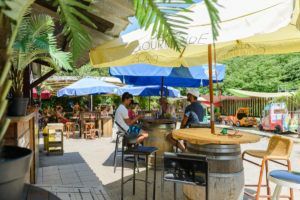 The restaurant l’Auberge Gonflée is a beautiful stone building with a terrace overviewing the mountains of the Arèche and the greens of the mini-golf. They offer a traditional cuisine in a friendly and warm environment. On holidays, with friends or family, this restaurant is the ideal spot for a nice moment with all budgets.